An African Alphabet is a vibrant ABC book that introduces babies and toddlers to the unique variety of animals found in Africa. Stunning linocut-influenced artwork brings an uncommon selection of critters to life in this lively concept book. 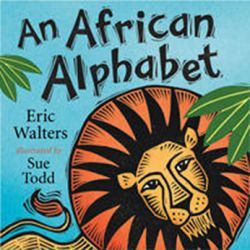 From aardvark to zebra and all that's in between, little ones will love learning their alphabet with these colorful creatures. Infant-Toddler. Boardbook.